B.E.L.I. 's mission is to unite belly dance instructors and performers into a sisterhood committed to providing the highest level of quality instruction and the most captivating professional performances possible. We will adhere to unified rates standard to our industry in order to preserve the integrity and credibility deserved of Middle Eastern dance. B.E.L.I. holds workshops throughout the year in which it shines light on local talent; doing business in our backyard! ﻿Students from all around Florida learned from 4 popular South Florida instructors in their hour and a half mini workshops! In these mini workshops, students got top notch, concentrated material, without all the fluff! See pictures of all the fun below! 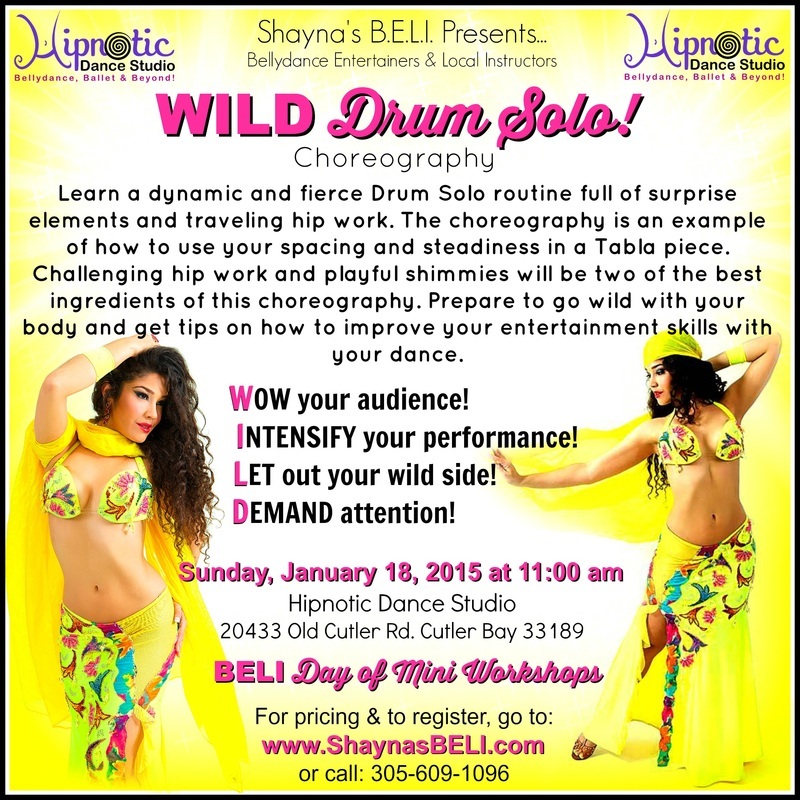 WILD Drum Solo: 11:00 am Learn a dynamic and fierce Drum Solo routine full of surprise elements and traveling hip work. The choreography is an example of how to use your spacing and steadiness in a Tabla piece. Challenging hip work and playful shimmies will be two of the best ingredients of this choreography. Prepare to go wild with your body and get tips on how to improve your entertainment skills with your dance. 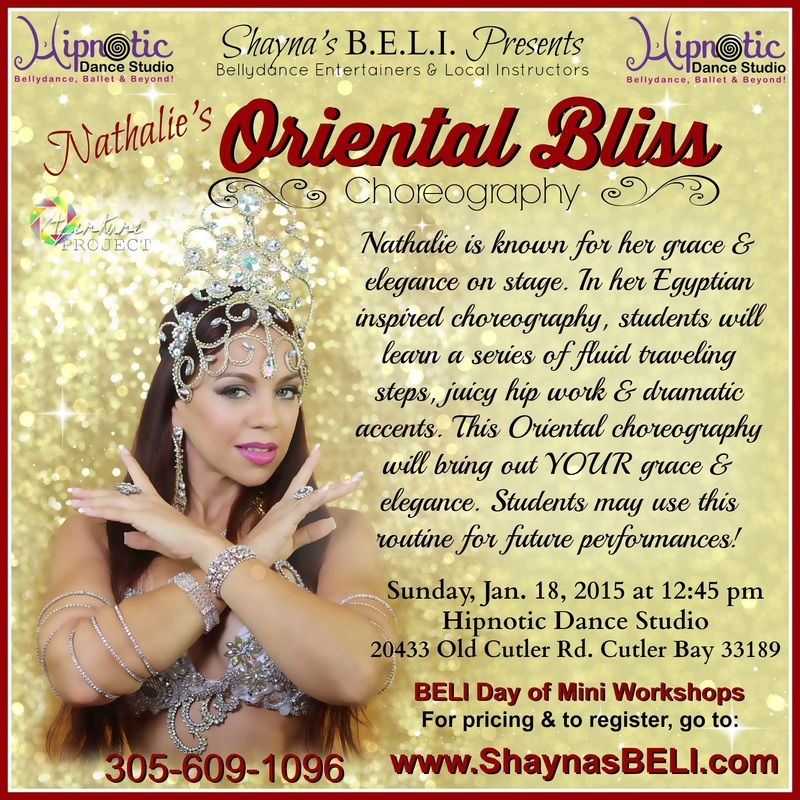 Oriental Bliss: 12:45 pm In this Egyptian inspired choreography, Nathalie will show students a series of fluid traveling steps, juicy hip work, musical combinations, and dramatic accents. In this choreography students will have the opportunity to purchase the music at the end of class and use this routine for future performances. Intermediate/Advanced levels. BALADI SHABBY: 4:45 pm Hind will be teaching a baladi style shabby choreography filled with energetic cheeky, sassy moves to a famous Egyptian song! She is known for her emotional feelings along with her choreographies that are full of authentic and interesting moves & combinations! Thank you for your support of B.E.L.I. and our talented local instructors! A Look Back…. . .
BELI brought together some of the best belly dance instructors in the area on Sunday, April 28, 2013. Each instructor taught a mini one hour workshop. Students from all around South Florida came to this unique event to study with some of Miami's best instructors including Anaizh, Kelly, Shayna, Aiza, Isis San Miguel, and Monica Silvestri. Look below to see how much fun they had! BELI #2 Included top instructors from South Florida like: Jihan Jamal, Zizi Zabaneh, Majilyn, and Shayna Lee. See their workshop information below! 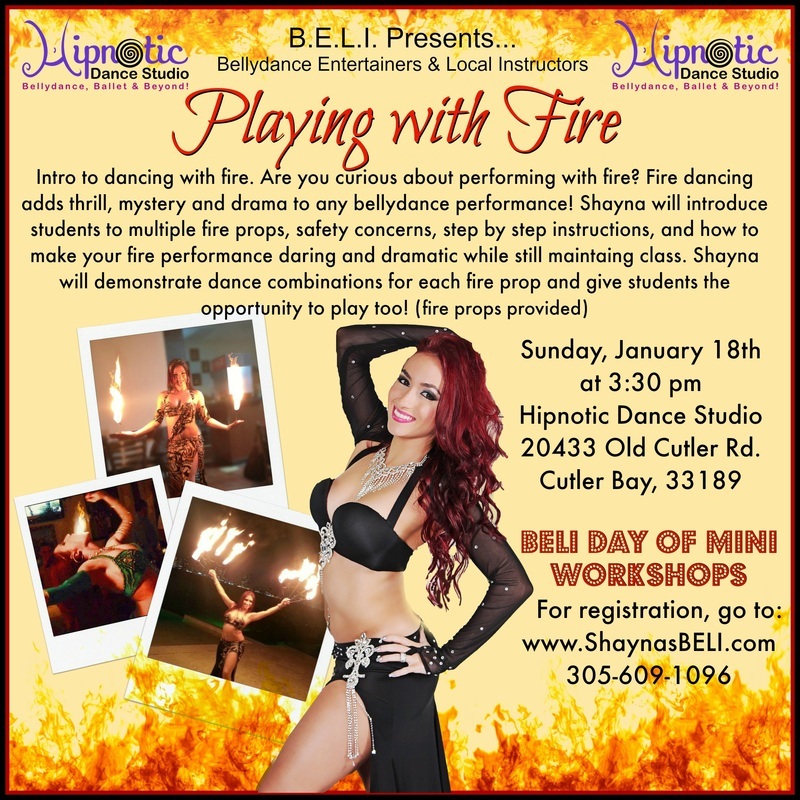 On Sunday, January 26th, 2014 we another fantastic day of mini workshops featuring South Florida's top belly dance instructors! January's workshops featured belly dance master Jihan Jamal, the graceful and elegant Majilyn, the flamenco-bellydance fusion master Zizi Zabeneh, and BELI's creator and host Shayna Lee!